A gritty and very original take on the vampire lore. (In fact, the word vampire is never uttered.) Moments of quiet atmosphere are followed by intense action. The cast is great and obviously had fun in their roles. Mae is a quiet girl holding a secret. Her gentle spirit offsets the crass behavior of those around her. She’s consistent and devoted, doing what she can for the others. She keeps her personal life and appearance hidden, but that doesn’t stop her spirit from shining through. Michelle is always there, quietly supporting in the background. If she were to leave though, it would leave a big hole in the blogging world. Michelle is a writer, flash fiction master, and one awesome Ninja Minion. For the simple fact you don’t allow excuses – you are always there, always trying, always believing! Near Dark was Bigelow’s directorial debut, but it was also the last film ever produced by this major studio, often symbolized by three letters – name it. Anne R. Allen had an informative post this weekend about Amazon algorithms. This weekend I received a sweet photo of Jennifer Hillier and Nancy Thompson out causing trouble. But they’re both cute, so they can get away with it. Rachel Schieffelbein is hosting the Secondary Characters Blogfest on May 22 in honor of the release of her upcoming book. Thanks to everyone who signed up for the Best/Worst Movie Remake Blogfest on May 17! And I wanted to share commercial with you guys. Yes, this is a real Internet commercial. Ever seen the movie Near Dark? Following the awesome Michelle? Any Alice in Chains fans? Know the trivia today? Excited about the blogfests? And after watching that commercial, what word did you hear besides ship…? Geez! it's so late already? Or so early! I have not seen that movie but Michelle is wonderful, I agree. Very sweet and supportive. Great girl! I've heard of Michelle before, but I don't follow her. I should and will follow her. Awesome choice, Alex! I'm loving this theme more and more! I haven't actually seen Near Dark. I'll have to go find it. That commercial is hilarious. I wonder how they all got through it without laughing. I didn't hear "ship" until I was listening for it. Will check out the cool ladies and make sure I'm following them. Oh, hey, it's ninja day! I remember there was a jeans brand back in the '80s/'90s called No Excuses. I don't know Michelle, but she sounds like a great gal. Looking forward to your blogfest next month! You found a very strange movie I've never heard about it. Sounds like my kind of movie! I like grittier takes on vampires. I think 30 Days of Night is another good example of that. Everything you said about Michelle is true, and she does have that mysterious ninja quality! Loved that Kmart commercial! "I just shipped my drawers," is my favorite line." Good of you to cheer everyone up Alex. I'd forgotten all about Near Dark, what a great movie!!! An awesome song by an awesome band for an awesome writer! I don't know the flick though. But aw, there we are, cheering you, Alex! Such a fun time we had. Someday, you'll have to join us. Surfing! Of course! Why didn't I think of that? Already signed up for the blogfest. And isn't that ad hysterical? Can you believe some people are offended? I laughed! Don't think I've seen Near Dark before. Jen and Nancy look very mischievous in that photo. Great choice for your theme. Looking forward to your blogfest so have to get thinking about that before long. Jennifer and Nancy out on the town together - looks like trouble. I saw the ship my pants ad on YouTube the other day and had to show my kids. We giggled until we nearly peed. I just shipped my sheets! Alex...it's too early to have something that funny on your blog! I almost shipped myself. Oh...I sent you an email (earthlink)...don't know if that's an address you check often. I actually got a good night's rest an so did Sweetman so I got up early to read posts. Yay! Is the vampire movie a new one? Near Dark...got to watch this movie now!! Hahahahaha! Thanks for the laugh. It's a great way to start my day. Everything here is new to me today. New movie, new blogger (Michelle) and new song. Hilarious commercial for Kmart in a mess in cheeks sort of way. Yay!! I'm featured today! Thanks a million! Alex, you more-or-less nailed the description! And "no excuses" is an integral part of my life philosophy. (Checked out the video... great track!) Don't dwell on excuses, because then the focus is all skewed. I don't want to hear excuses, I want solutions! Pronto! I am the eternal optimist... though it's a "reality-driven" optimism! I see things for what they are! No rose-tinted spectacles for me! Video won't play. Windows 8 hates me. I can barely get anything done since the last "update". Am about ready to pull my hair out. Haven't seen that movie, but reminded me of Pitch Black, though that's an entirely different movie! Yeah for Michelle! Been to her place before because I recognize the banner. Will have to go say "Hi" again. And HA! I made it to your blog today before you made it to mine. That has NEVER happened! Never heard of Near Dark, I'll sorta try to check it out. I love Michelle from the writer in transit. She's awesome. I'm going to have to make a list of the movies you listed during this challenge and watch the ones I haven't seen before. Ship my pants! Hot stuff lol!! I haven't seen that flick but sounds interesting. May have to check it out soon. For the trivia, I can only think of MGM but that can not be right so moving on. Great pic of the chicas. The drinks look delish. Robyn, we watched it several times at work yesterday and couldn't stop laughing. Samantha, glad you can join us. Ray, someone who remembers it! Elise, some of my best blogger buddies came from the Challenges. Nancy, I think it's hilarious. ML, glad I could give you a good laugh! Shelly, it came out in the 1980's. Michelle, you are most welcome. Not too sure about the bag over your head though. And yes, you are a flash fiction master. Tina, first time for everything, although I was just at yours, so it was close. That Kmart ad went viral. I think it's cringeworthy funny. Near Dark is totally unknown to me. Anne R. Allen's post about Amazon algorithms is indeed interesting. MGM I think. That's unusual for me to know a trivia. Ship my pants is great. I must see near Dark, I am sure I would enjoy it! Yeah, Michelle is the best! Wow, haven't thought about (or seen) Near Dark in ages. Great flick. That commercial is being sent to my husband as soon as I'm done writing this! Hilarious! Ship my pants!! LOL!! I just shipped my pants in bed!! LOL!! Pants is knickers here btw! LOL!! Is it MGM for the trivia question? OMG. I've seen that commercial posted but I hadn't watched it yet. I saw that a similar pic of Jennifer and Nancy drinking strawberry somethings. They were having fun for all of us! Never seen Near Dark, but Michelle is amazing and a great choice. She's so supportive. Cute pic of Nancy and Jennifer. Super cute picture! Never heard of the movie, but my brother used to blast Alice in Chains in his room so loud, my bed would literally shake even though it was down the hall from his, lol!! I've never seen near dark, but I love Michelle! I loved Near Dark. Creeped me out though. Hilarious video and I thought they were saying sh.. my pants and was going to say I did too... from laughing at it. I then looked up and saw Shipped My Pants! My bad! :) Thanks for the laugh today! I have not seen this movie, but I will if Netflix has it. Don't really know Michelle, I'll have to stop by and check her site out. Not in the VI can you "Ship you pants for free." Ha! Near Dark is messed up, with its gory modern nomads. My favorite part is actually the stories the actors tell of pranking locals with their make-up. Never saw Near Dark. Need to see it now. Thanks for introducing Michelle! I will pop over and check out her blog! Oh, sadly I've never seen that movie, don't know the music, but I love you anyway! Angela, no, but you're on the right track. Edi, it's a real cool, low-budget type of flick. Melanie, he will enjoy it! Jaybird, your brother was cool. SL, that's three of us that have seen it. John, I heard Bill Paxton really had fun. I messed up on the trivia thinking in terms of frozen water and wheels with boards, but oh well. And I don't know the trivia today. It sounds like the blog world is rocking as usual . . .I have to check out that secondary characters fest. I think I'll the K Mart ad men! That was too funny. I haven't seen the movie, but then I haven't seen a ton of movies. Yeah for Michelle. Flash fiction master describes her well. Nancy and Jennifer. I'll get the place was rocking! Switchfoot are surfers?! Wow, I did not expect that. I love this, Al. And am inspired by it. You're right, they're cute. And the commerical... lordy. LOL. Thanks for helping spread the news, Alex! And yet another movie I've not seen. I saw that "Ship my pants" ad yesterday Alex. It's hilarious and a bold move by the company. I hope it pays off since I never even think of shopping at Kmart. Michelle is a honey. Having a great time with her A-Z theme. LOL. I don't think I'd have much fun doing a blog where I keep my personal life hidden. I love Alice in Chains!! Jennifer and Nancy look like they're having fun making trouble. Unbelievable commercial. :) Makes you remember it! Another movie I have never seen! Love the commercial!! Hilarious. Thanks for sharing. High fives on Near Dark! I love that movie and Mae rules. I love Alice in Chains. Saw them in college way back when, what a great band. Too bad about Layne Staley. I couldn't even imagine what Ship My Pants was referring to LOL. Love Near Dark, and that commercial is hilarious. Kudos to the marketing company that came up with that one. Glad to discover the meaning of Switchfoot! I like them, but don't know much about them. Makes sense that they would be surfers and that term makes sense as well! OMG! That commercial. I didn't hear the naughty word until the boy used it in the past-tense. I love Michelle's blog. Great gal to feature today. I haven't seen the movie- will have to go check it out. i have not met Michelle yet, will go visit her now. And what a funny commercial. Thanks for sharing! Tyrean, the board part was right. 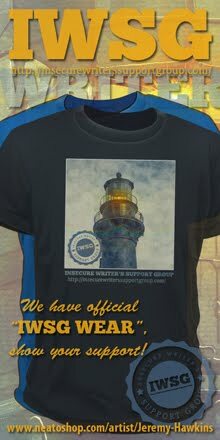 Birgit, not MGM, and please join us in the blogfest! Ilima, that made me laugh. Maurice, I thought it was a very bold move, but they needed to do something. Misha, that is a good excuse though. Melissa, awesome! And I almost saw them, but they had to cancel. I wish I'd taken the time to watch Near Dark so I could better appreciate your thoughts on it. Very interesting Alice in Chains, great song! Near Dark is my favorite vampire film! Ah to be cute like Nancy Thompson AND a trouble maker would be divine! I have seen that movie...?! Bahahahahaha Holy "crap" that commercial is hilarious. Although, it did take me a few seconds to get it(refer to letter J of my A to Z challenge). My favorite part is the guy who "shipped" his bed. Thanks for sharing, Alex. Dont know that movie tho. Definitely interested in that algorithm, I'll go check it out. Near Dark is a fun film. And who doesn't love some Alice in Chains! My husband just showed me that Kmart commercial last night. Hilarious! Charles, one of my favorites! Julia, glad it made you laugh. Annalisa, most people haven't seen it. I haven't seen that movie and I am looking forward to the blogfests. I can't believe how my calendar is filling up so fast for May. I haven't seen Near Dark but Darkness certainly is catching on in movieland. Michelle is awesome. And I think I learned I'm really 12. I've not seen that movie. Love Michelle, though. Never heard of the movie. I'm learning lots during A to Z.
Michelle is an awesome blogger! I can ship my pants? Ooooo, so clever! LOL! My son just showed me that commercial the other day. Soo funny! I haven't seen Near Dark, sounds too scary for me, but congrats to Michelle! Alex: I am so sorry that trying to keep my family afloat keeps me from entering your challenges each week. I love your blog, and thank you for the challenge. Michelle is one of my fave peeps! She's also a great cartoonist and she's pretty funny, too. Susan, mine is already full. Ciara, what can we say? Michelle is awesome. Great choice! You were correct, sir. We did in fact love that commercial. Brilliantly executed and very clever. And hey, now that we're making a movie and I'm playing a hipster, I can ship my skinny jeans in excitement. I really liked the K-Mart commercial -- borderline crude without stepping over the edge. I might watch Near Dark, even though I tend to ask myself over and over during scary movies, "WHY AM I WATCHING THIS WHEN IT'S SCARING THE CRAP OUT OF ME?" 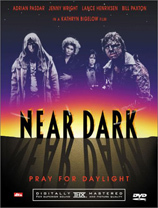 I've never heard of Near Dark.. But sounds like a good one. I love Alice in Chains, especially that song. It's one of their more uplifting songs in my opinion. That kmart commercial had me rolling. I almost shipped my pants at work! Near Dark is one of the greatest vampire movies ever. Lots of great lines from Bill Paxton and Lance Henrickson! I love the ship my pants video. That's hilarious. You know I am a big AIC fan and No Excuses is one of my faves. Good choice. That is a cute picture of Nancy and Jennifer! I love that KMart commercial, it is hilarious. Oh what a lovely song to dedicate to Michelle! You know I read this post at like 7 am this morning and thought I commented until just now when I realized I didn't. *shakes head* I'm sorry Alex. Its been a long day. Never heard of the movie, but that is not surprising. ...In the dark ... that's me when it comes to stuff like that! I hope I get a bonus point for commenting at three in the morning. Yes, after delighting close to 100 bloggers doing that darned alphabet challenge, I've finally arrived. I see Nancy and Jennifer are partying. I love Michelle at Writer in Transit! The commercial cracked me up!! I do know Michelle, yeah! But, I don't know the movie or the trivia. And Michelle rocks! Good choice. I don't think I've seen that movie yet. I've never seen Near Dark, but I will soon. Sounds very interesting! That K-Mart commercial cracked me up! Brandon and Bryan, knew you'd like it! Great film and great song choice! You have great taste! Wow, I've not seen Near Dark in years! I'll have to dig this out and give it a rewatch. Hey, ALex -- trying to get caught up a little. I'm still hanging in there trying to get my A to Z posts in. Yes, I did a "sneaky" post or two, but I'm trying. "No Excuses" came out at the perfect time in my life and got me through some really rough times. Goosebumps everytime I hear it.